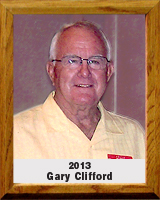 Gary began his career, as an athlete in 1950 when he participated in the first organized year of Tucson Little League baseball as a member of the Valley National Bank team. That team won the first of three consecutive city championships. He attended Pueblo High school from 1955-1959. He played freshman and junior varsity football and baseball. In his junior year he played varsity football under Hall of Fame Coach Lou Farber. Also in his junior year he was a runner-up in the 1957 state finals, in wrestling, in the 145 pound weight class. During his senior year he achieved many honors including being named offensive back of the month by the Tucson Citizen for the months of September, October and November 1958. He was selected first team and Captain of the All-City football team by the Arizona Daily Star and the Tucson Citizen newspapers as well as first team All-State and co-captain by the Arizona Republic newspaper in Phoenix. Many of Gary’s records from his football career at Pueblo High school still stand including scoring 161 points in one season, 266 yards rushing in one game, 22 touchdowns in one season and 29 points after touchdowns. After high school he received a football scholarship to Palo Verde Junior College in Blythe, California. Following college he became a member of the PRCA (Professional Rodeo) where he participated in numerous rodeos as a team roper. In the mid ‘60’s he began his fast pitch softball career where he played for Witthorne Glass, Cactus Room, Iceland Bowl, Latin American Club, The Tucson Kings, and Finley Lites. During the 22 years of playing fast pitch softball he appeared in numerous state and 4 world tournaments. In 1976 Gary was named Southern Arizona Softball Fast Pitch Player of the Year. In 1980 he was named Coach of the Year in Southern Arizona. He was selected, numerous times, to all tournament teams and in 2009 he received one of his greatest honors when he was inducted into the Arizona Softball Hall of Fame.